Studies show that 89% of the American business landscape is made up of small businesses employing less than 20 workers. Blackford County is no different. Recently the Blackford County community was invited to an informational roundtable discussion with Ted Baker, the Executive Director of the Innovation Connector located in Muncie. During the hour-long discussion, held in Montpelier, about the importance of Small Business and Business Startups, Baker went through “the emotional journey of creating anything great.” He spoke about the ups and downs, the dark swamp of despair, and the importance of persistence. He explained how some business owners “get lost working in their business, instead of working on their business.” He went through some of the mistakes to avoid when starting a new business and/or continuing to grow an already existing small business. Three essential skills were discussed: complex problem solving, critical thinking and collaboration. He spoke with passion about wanting to “strengthen rural businesses” and reaching out to help people of the community reach their goal of becoming a potential business owner. Baker shared his childhood entrepreneurship with him starting at just eight years old with the mindset that he was all about business. At that time, he had no realization of the big impact he would be giving those who he’s been able to help all these years later. Baker has a very open and honest personality. His realistic and practical thinking allows for those he’s helping, whether it’s coaching or lecturing, to feel connected. It also gives them hope that their dreams of owning or running a business can happen as long as the passion and persistence is there. Listening to Baker speak one thing became very clear, he has a big heart for what he does. After graduating from Ball State University in 1980, Baker’s has had a multi faceted career including management of small businesses, the starting, growing, buying and selling of businesses, as well as assisting with the establishment of several area not-for-profit organizations. He has also had experience in successfully exiting a company, franchisee/franchisor relations, and workshop and training facilitation. Baker is a Certified Incubator Manager with the International Business Innovation Association as well as a Certified Growth Wheel and a Certified Wendy Kennedy International Business Coach. Baker serves on several boards as well as an instructor in Entrepreneurship at Ball State all while being heavily involved in the community. In 2002, The Innovation Connector became a reality by locating in a residential space adjacent to Ball State University and within two years expanded. With continued success, they moved to an interim facility in downtown Muncie. In 2007, the board of directors approved construction of a 15,000 sq. ft facility to be located at the Ontario Place Certified Technology Park completed in 2009. The past several years have been an exciting time of change and growth for IC. In 2010, they welcomed Baker as the new Executive Director. During this time, the IC number of businesses that call the IC home has increased to over twenty businesses. The IC provides direct connections to services, resources, experienced business men and women, and supporting agencies right within the building. It also connects them to business professionals in the community. These are connections that individuals might not make on their own. With these connections, their staff has seen the growth of businesses and success of clients, both internal and external. The IC exists for one purpose: to help new entrepreneurs with truly unique business ideas turn their dreams into a reality. Currently in order to address the needs of transient professionals and home based businesses, the “Landing Zone” opened in, 2013. The Landing Zone is a place for non-traditional entrepreneurs to not only work, but network and grow. Benefits include one desk in a shared workspace, high-speed internet, 24/7 access, use of IC conference rooms, a USPS mailbox, access to a printer/copier, bookkeeping, and business coaching. In 2014, the IC joined the City of Muncie in a collaborative project sharing in the creation and management of the Downtown Business Connector located on the floor level of The Lofts of Roberts in Downtown Muncie. This collaborative, open concept co-working space allows the Innovation Connector to extend its ever encompassing services to entrepreneurs, independent professionals, freelancers, and startup businesses seeking an affordable alternative to dedicated office space or coffee shop housing. This article originally ran on hartfordcitynewstimes.com. On Wednesday November 14th, The Innovation Connector celebrated innovation within our community at our Excellence in Innovation Awards Dinner. 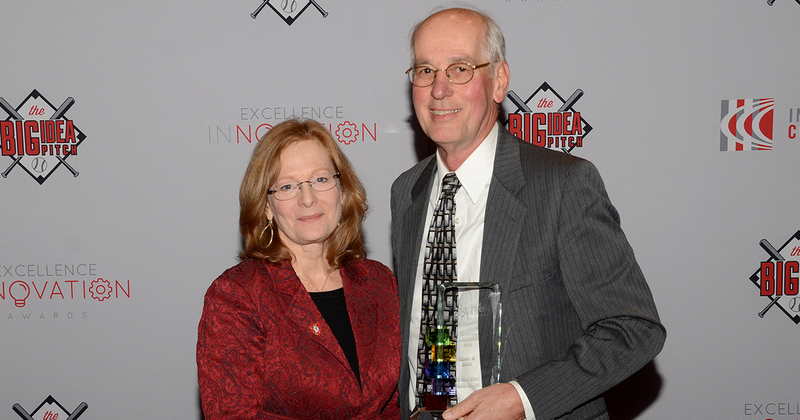 Five businesses were recognized for showcasing innovation in their day to day business activity. One of those five businesses are highlighted below. Heidi Hale is the innovator behind it all. What started as a gift of an ankle bracelet for her mother spread into a hobby of making gifts for family and quickly turned into a full-time passion for Heidi! In 2002, without formal training, Heidi just went for it. She started local by selling to friends and family. Then she set out to sell on E-Bay. The first piece sold and immediately emails poured in asking for more items. Heidi has sold thousands and thousands of items all over the world and her pieces have even been spotted on celebrities like Eva Longoria and Hilary Duff. The great thing about it all – everything is made in Muncie, Indiana. Every piece of jewelry offered is designed and handcrafted by skilled metal-smiths and local artisans in downtown Muncie, Indiana. Because everything sold is something created right here, HeidiJHale is proud to say that all jewelry is made uniquely and of the highest quality. The HeidiJHale online store features the most popular items that are shipped to customers anywhere on the globe. In 2015, HeidiJHale Designs & Details opened their very first retail store in the heart of downtown Muncie at 301 S. Walnut Street. It is also the home of the studio where every piece of jewelry is created! There you can find our most exclusive and one-of-a-kind pieces not sold online. Steve is the Chief Executive Officer and Chairman of the Board of Mid-West Metal Products Co., Inc. located here in Muncie. Steve received both his Bachelor’s and Master’s Degrees from Indiana University. Since he began his career with Mid-West Metal in 1975, Steve has witnessed many changes in the steel and metal industry including the emergence of foreign outsourcing and the entry of big box stores and online sales to the retail marketplace. As most of you might know, Mid-West Metal Products is the leading provider of PET HOMES in the United States. Although Mid-west Metal Products had implemented robots into their manufacturing processes, they were still forced by their main customers to open manufacturing operations in the Far East. This was a very difficult time for Steve and the Mid-West Metal team. The thought of moving their production operations overseas with the potential loss of employment in the Muncie community was hard for them to swallow. However, with the future of their business on the line, they had no other choice than to follow their customers’ demands. 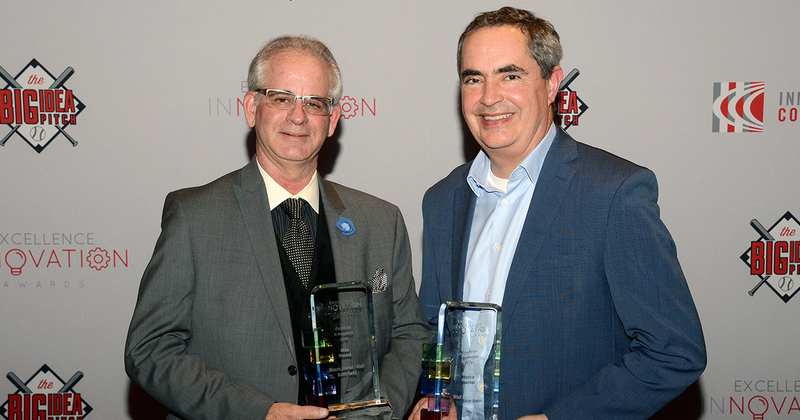 Mike Rhodes (left) was awarded a 2018 Excellence in Innovation Award for showcasing innovation in his business. MuncieJournal.com has become a source for positive news about Muncie and Delaware County and launched on July 1, 2015 as a product of Woof Boom Radio, LLC. Even though MuncieJournal.com only publishes stories about Muncie and Delaware County, viewership is continually growing (up 30% last year) and vast. The Top 10 cities with the most consistent viewing activity of MuncieJournal.com include: Muncie, Indianapolis, Fishers, Carmel, Chicago, Anderson, Yorktown, Louisville, Fort Wayne, and NYC. Muncie Journal’s primary focus is to highlight positive news in the areas of education, economic development and quality of life in Muncie and Delaware County, IN. Mike Rhodes is the publisher and managing editor of MuncieJournal.com. Rhodes is a Ball State graduate with degree in journalism and has lived in Muncie since attending Ball State. Rhodes has also played a key role in kicking off other community website initiatives in the community, including the very first website and corporate intranet launch for Ball Memorial Hospital. Rhodes is currently putting the final touches on a project that will enable Muncie Journal stories to be read out loud by Amazon’s Alexa enabled devices. 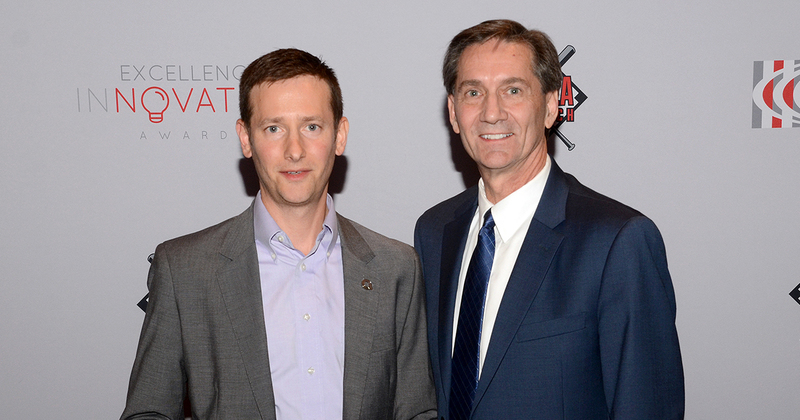 Adam Unger (left) was awarded a 2018 Excellence in Innovation Award for showcasing innovation in his business. Adam Unger is President of Accutech Systems Corporation (ASC), and has been working with ASC since 1999. Prior to becoming President, his roles included: Inside Sales, Director of Marketing and COO. Adam is responsible for setting the vision for the company and developing long-term strategic initiatives. Adam leads the internal executive team and outside board of advisors. Accutech Systems Corporation is a software solutions company serving the wealth management industry. With their team serving over 250 clients, they believe that wealth management is more than just tracking numbers, it is about relationships and they believe relationships are about service. ASC was founded in 1987 and currently has 75 employees with twenty of those employees hired on in 2018. Accutech takes the bureaucracy out of doing business and brings trust back into the equation. They partner with their clients by providing technology and services focused on making great things happen for other people. 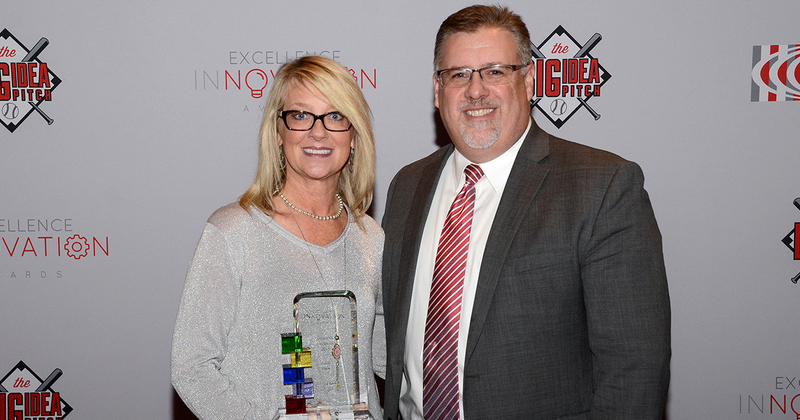 Brooke and Brian Shrieve were awarded a 2018 Excellence in Innovation Award for showcasing innovation in their business. Amber’s Beauty School has served the community both as a cosmetology school and a destination for people in search of great salon services since 1936. The school is proud of its heritage and family ownership that spans several generations. When you visit either as a student or a customer, you’ll feel that family feeling that is so valuable to all. 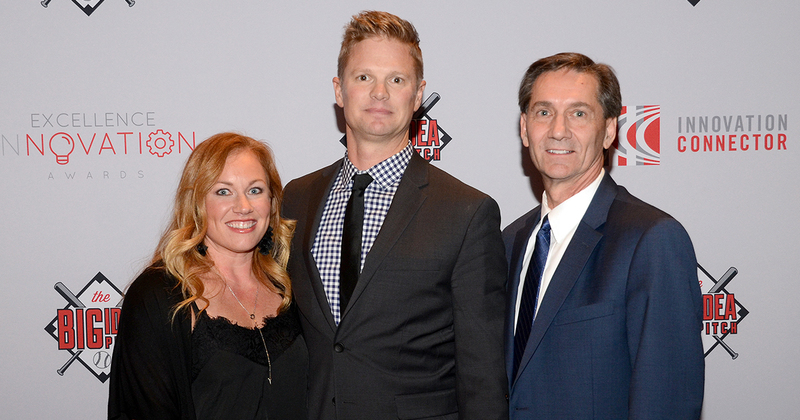 In May of 2008 Brian, a third generation Shrieve, and his wife Brooke, purchased the school. Being a young couple they have made many great changes. It has a contemporary new look with innovative training and services. “We’ve seen a great deal of change over the years. And while we stay up to date on the very latest styles and trends, we’ve never changed our commitment to providing a high-quality, hands-on education to our students, and excellent products and services to our customers”. If you’ve been involved in the “entrepreneurial ecosystem” around Muncie and East Central Indiana, then you’ve probably had the opportunity to hear or meet Peggy Cenova, regional director of the East Central Indiana Small Business Development Center (ECI-SBDC). Because she’s seemingly everywhere! As you know, the Innovation Connector has been the home to many startup businesses and organizations in the Muncie community. Mark Slusher’s company, Endpoint Creative, is one of them. The company specializes in digital video production, visual marketing, and high-end live video streaming. 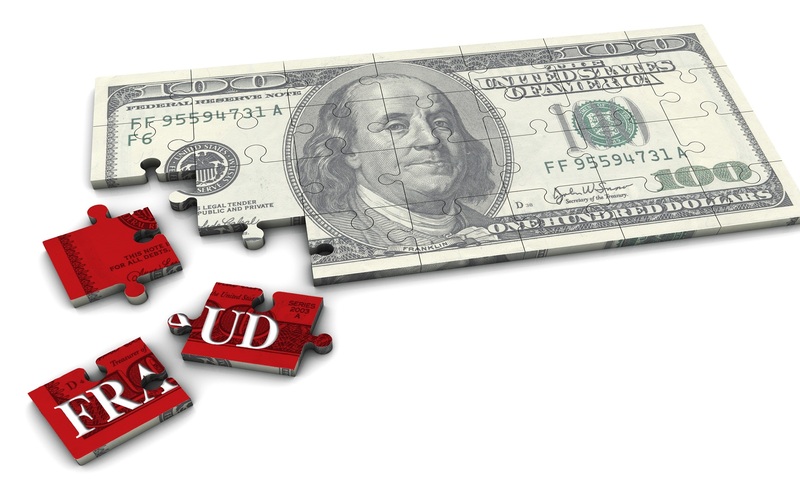 Internal Control and Anti-Fraud Experts, LLC. a.m. to 10 a.m. workshop), and then at The Innovation Connector, 11:30 a.m. to 2:30 p.m.
attend the workshop, and registration is required. Seating is limited. Click here to register for the Fort Wayne Workshop. Click here to register for the Muncie workshop. Director, Women’s Entrepreneurial Opportunity Center (WEOC). CVA, CDFA, CGMA, Haines, Isenbarger & Skiba, LLC, workshop sponsor. Isenbarger & Skiba, LLC; PNC Bank, and The Thompson Group. Center—one of two in Indiana. For more information, visit www.inweoc.com. 2008 registered business incubation and acceleration program. https://theniic.org/. visit https://fortwayne.score.org/ or call 260-422-2601.